Queso blanco, literally "white cheese," is a fresh cheese that is slightly firm and chewy and does not melt with heat. This property, along with the fact that it has a very mild flavor and absorbs seasonings well, makes it a terrific choice for adding to cooked dishes. In fact, you can almost consider this traditional Latin American cheese as the dairy alternative to tofu (soy milk cheese). Queso blanco cubes work well in stir-fries and soups, and can be added to scrambled eggs, or browned with seasonings in a pan and served atop salads. Warm the milk to 92°F, then stir in the buttermilk. A wire whisk or slotted spoon works best. In a small bowl, mix the rennet with the water. Add the rennet mixture to the milk while stirring constantly. Continue stirring for at least a minute to be sure the rennet has been thoroughly mixed with the milk. The milk will quickly begin to form small curds. Cover, and leave the milk to set for about 30 minutes, keeping the temperature fairly constant at 92°F. There are several methods for doing this. One is to have a larger pan filled with water at the correct temperature. Set the container of milk in the larger pan, making sure the water won't overflow into your milk. The water acts as an insulator, keeping the temperature of the milk steady. Another method is to simply keep the pan on a small burner, and check the temperature every few minutes. If the temperature falls by a degree or two, turn the burner on for a few seconds until it returns to the correct temperature. You do not really want to stir the milk, as this would interfere with the formation of the curds. After 30 minutes, cut the curds into 1" cubes. Soon, the curds will fall to the bottom. Pour through a strainer to drain the whey. Cheesecloth usually isn't necessary, as the curds will be large and fairly firm. After draining, add the salt to the curds, and mix well. At this point, we need to press the curds to form them into a single block that can be sliced into the traditional cube shape. If you have a commercial cheese press, you can use it with a light weight setting for around 3-4 hours. However, you can also press your queso blanco successfully with a homemade cheese press set-up. The four key components you will need are: a pan to catch the whey, a colander or wire rack to hold the cheese out of the collected whey, a cheesecloth-lined container with holes for drainage, and a weight to press the cheese. The curds should be placed in the cheesecloth with the edges wrapped over the top, and the weight placed over them. To the left is my example of a crude, but effective, homemade cheese press that includes a baking pan to collect the whey, a cheesecloth-lined cheese mold on top of a wire rack, and two bricks in a plastic bowl to act as a weight. You should easily be able to come up with a similar set-up using items available in your home. After the cheese has been pressed for 3-4 hours, remove it and cut into cubes if desired. Store in an airtight container or in plastic wrap in the refrigerator until ready to use, or for a maximum time of about a week. For the best results, when cooking with your queso blanco, remember to use in well-seasoned dishes, and allow plenty of time for the flavors to be absorbed. Adding a cup or two of queso blanco to soups, stir-fries and pasta dishes at the end of the cook time is a great way to increase the protein value of your meal! If you're interested in learning to make other types of goat cheese, check out Goat Cheese Making Recipes. 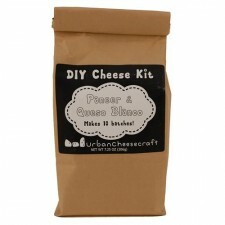 You can get all the supplies needed for making 10 batches of paneer or queso blanco cheese in the convenient DIY Paneer and Queso Blanco Cheese Making Kit from Cultures for Health. Articles are updated frequently, so check back here for any new information on queso blanco!